As I explained in my last video, my property has two driveways, one that leads to the house and one that leads to my shop. The house gate I made was more traditional but this gate I wanted to design something one of a kind and something to do with woodworking. After some thinking on it, I came up with a metal frame gate, with a wooden slab center. The slab will have cracks cut into it and bow ties spanning them. 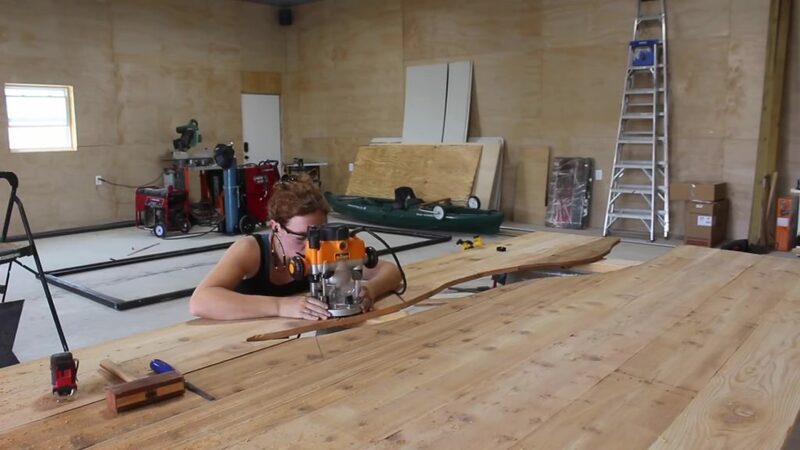 If you aren’t familiar with woodworking, a bow tie is something used to span over a crack in a slab of wood to hold the crack together and stabilize it. It’s something decorative but also functional. The end result might look heavy, but it’s isn’t too bad. To keep the weight down, I went with cedar for the center slab. 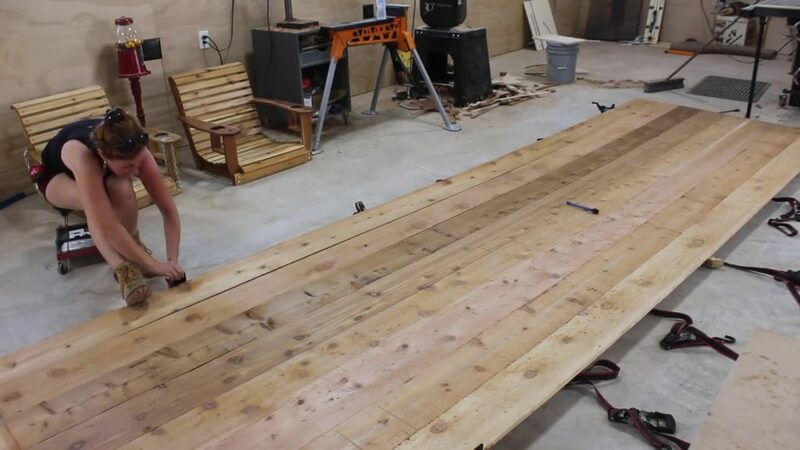 The gate needs to be 14’ across so I started off with 16’ foot boards and I began by laying the boards out on my shop floor to arrange the grain pattern. I wanted the gate to end up around 5’ tall so I bought 8 1x7s and started gluing them together one board at a time. This process took four days total as I could only glue up about two boards a day. 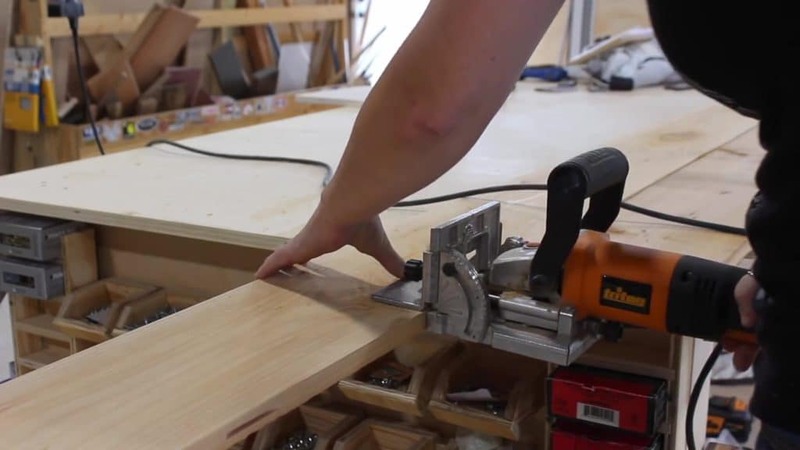 I used my triton biscuit jointer to cut in a slot every foot or so. Then I used Titebond III wood glue as it’s waterproof and this will be exposed to the elements. I built this frame the same as my previous gate, with thicker material on the bottom and the hinge side, then lighter material on the top and unhinge side. 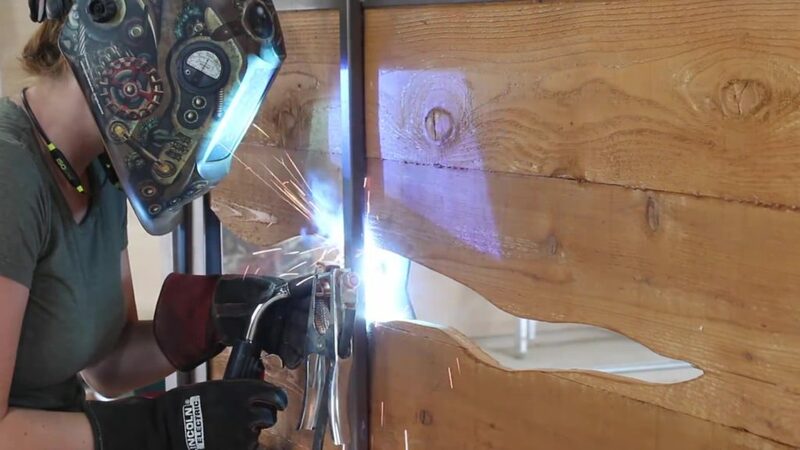 I started by cutting my square tubing to length at the chop saw, making sure I leveled each joint by shoring it up with scrap wood, before making the cut. 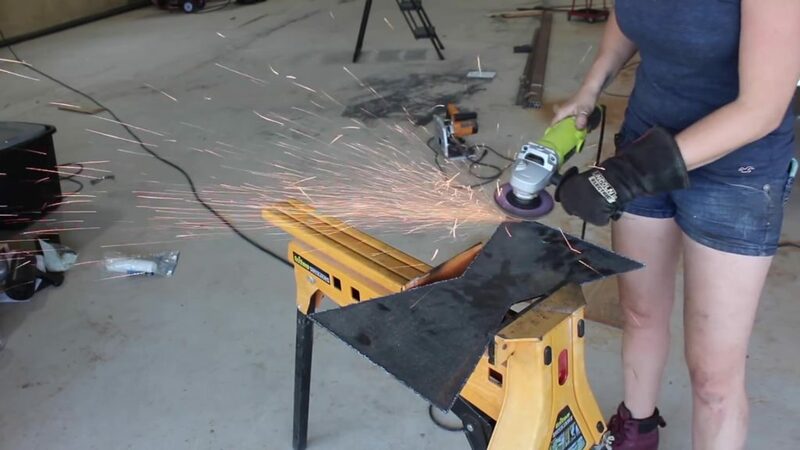 After getting the frame pieces cut, I cut a V notch into a scrap piece of wood then used this to hold the joints off the ground so I could bevel the ends to ready them to weld. 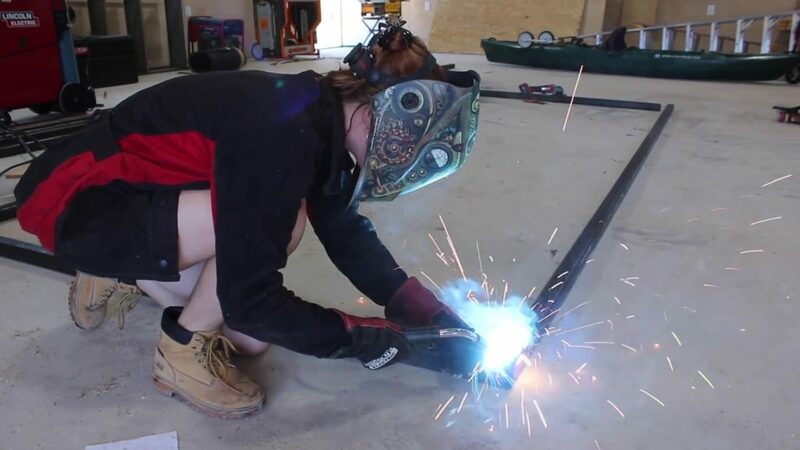 I would get the pieces nice and square, then also make sure they were flat to one another then tack them in place to start, make sure things didn’t move, then complete the weld. 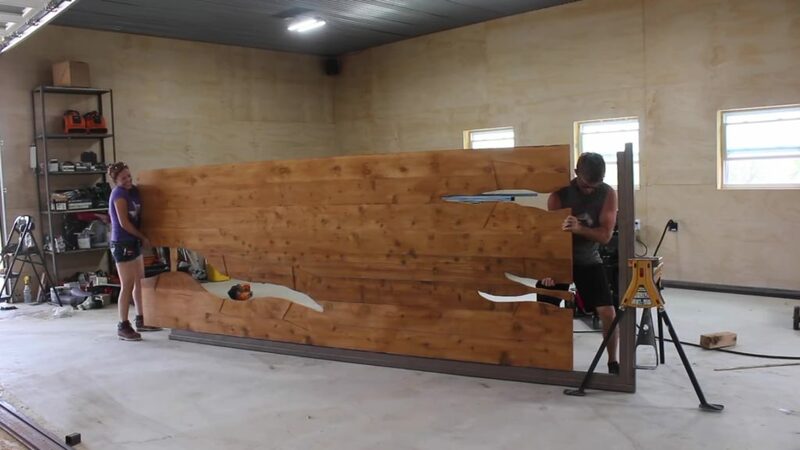 A few things about having a giant wooden slab center. The wood will need room to expand and contract. I consulted a master craftsmen friend of mine, Phillip Morley, and he recommended incorporating a U channel that will hold the slab and have empty space at the top that will give the wood room to move. I had trouble finding the size of U channel that I needed, so a welder friend of mine, JD, told me to make my own from flat bar. Perfect idea. So that’s what I did. I tipped the L frame up and used magnets to hold it flush to one side, which will ultimately be the front. 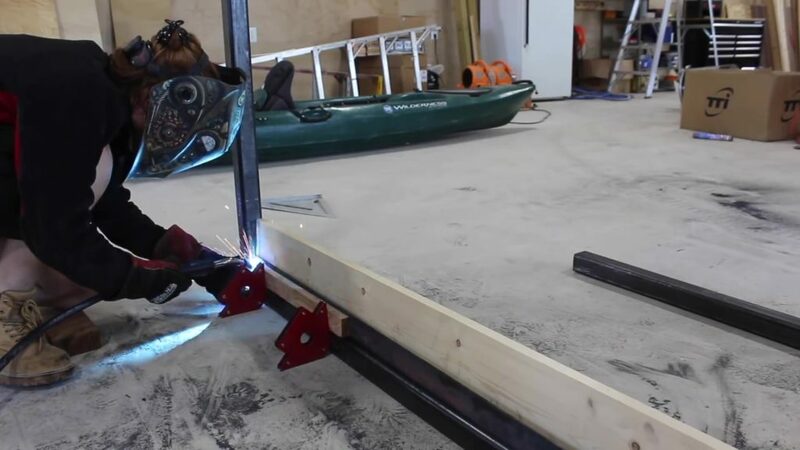 The plan is to make a channel to hold the slab by welding on a piece of flat bar to the front and then the back of the frame all the way around. After getting the front bar in place, I set a 1x piece of wood in place to represent the center slab then set in the back flat bar. This back bar isn’t as easy as the front because it isn’t flush to the tubing like the other. To make holding this in place easier and consistent all he way down, I used another scrap piece of wood as a spacer in between the magnet and the flat bar. While this held the 1x tightly enough, it also left it just a little bit of wiggle room. This process was really slow as this long length of flat bar wasn’t perfectly flat, so I worked in small sections, moving that scrap board down, then tacking behind it, moving it down, then repeating. After getting the bottom wrapped up, I repeated the process no the upright of the L frame. Starting with the front since it’s easiest, then moving the wood spacer in place to start on the back. 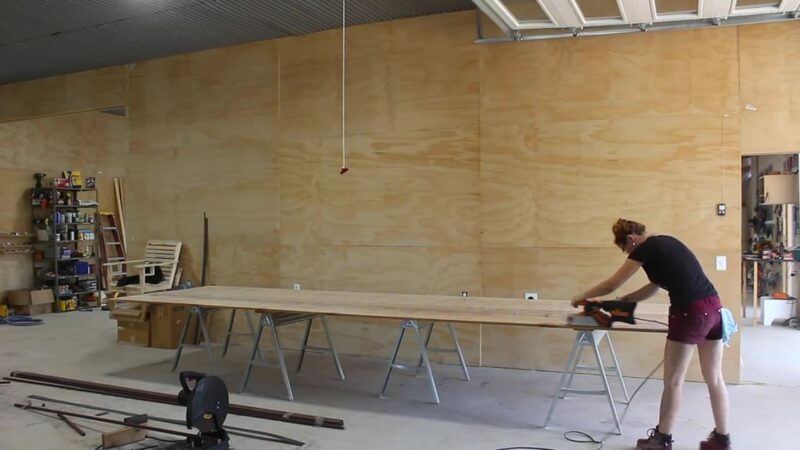 All the while, I would jump back over to the woodworking side of my shop when the previous board was dry, in order to glue up another board to the slab. I very quickly ran out of long enough clamps so I resorted to using good ole ratchet straps instead. These don’t provide the best clamp support, but as this slab is all visual and not structural, I wasn’t too concerned about getting a perfect joint. Running these perpendicular to the glue up and under the strap. This way as I tightened down on the strap, this board would be drawn into the slab and keep it from bowing. Finally, the glue up was complete, so it got moved to the metal side of my shop so I could start cleaning it up and cutting in some cracks. It was pretty difficult working with such a large piece. 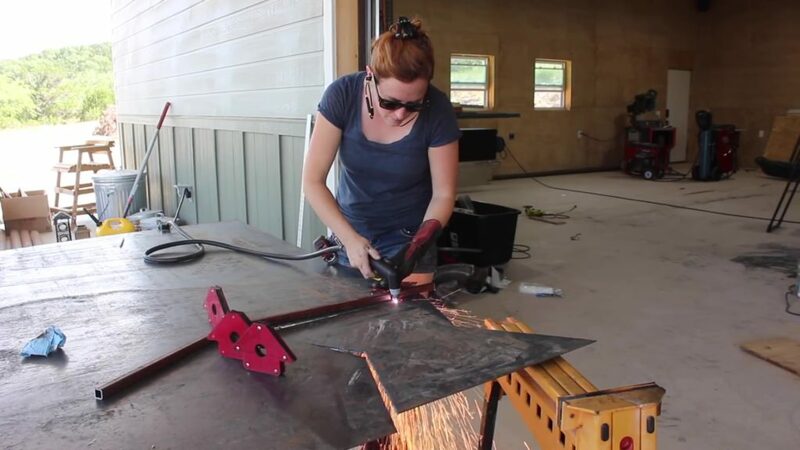 I used two sets of saw horses that I staggered to try and provide support to the entire slab. I started off with my 4” belt sander and went over the entire thing. I wasn’t going to perfect flat or smooth here. I’m fine with it looking a little rustic but I did remove the glue squeeze out and the majority of the fuzz that comes with cedar off the shelf. Next I measured my frame….about three times….to see exactly how long I needed the slab to be, then I used my track saw to cut it to length. Ah, ok moving on to the cracks! I sketched out the idea for the gate in a modeling software before getting started, so I already knew what I wanted the cracks and bow tie arrangement to look like. To replicate it as close as I could, I used a tape measure to mark a few key measurements, then connected the marks by free handing it. This process is simple, but it still took me most of the morning as I would draw something, look at it, then change it slightly and look at it again just to change something else. However, once I finally had three cracks drawn on that I was happy with, I started cutting. I started off by using my power carver. I was hoping the cutting tool would be able to cut all the way through the 1x material, but the diameter is just a tad too small. So I used this tool to make the initial cut from the top, then came back with a jigsaw afterwards to complete them. Up next was the making the bow ties. I’m making these from some 18 gauge sheet metal and will paint them the same color as the frame. I started off by laying out the pattern. Again since I first modeled the design to scale in my software I already knew how big I needed each bow tie to be. I’ll need five total with the biggest coming in at 24” and the smallest at 16. To cut these out I’m using my Tomahawk 375 plasma cutter which has an on board air compressor. I freehand a lot of stuff I cut out with the plasma cutter, but since I want these lines to be as spot on as possible, I set up a torch guide using a scrap piece of tubing and two magnets. I positioned this bar 1/2” off my cut line so that I can rest my cutting torch against it and cut perfect along my line. The set up is very quick and easy to move around so it took no time to get these bow ties cut out. Man! Doesn’t that look cool! I love the giant one, but heck, even the small steel bow tie is awesome in my opinion. The cutting leaves a build up of whats called dross on the back and since I’ll want these to lay flush into my slab I stuck each bow tie in my super jaws then used a grinder to knock off all the back dross. I found a 40 grit flap disc is the best tool for this step. And now is a step I probably spent way too much time on, considering there isn’t huge amount that can be changed…..but next was to position the bow ties on the slab of cedar, across their cracks. There is no right or wrong here, but I still took my time and made sure I liked the placement of all five before tracing them on to the slab. I wanted to inset the bow ties so they would be flush to the slab instead of resting on top. So after tracing them onto the slab, I stuck a straight bit in my router and started carving away the internals of the trace. I would start by going along the perimeter and getting the outline done, then worked my way inside. 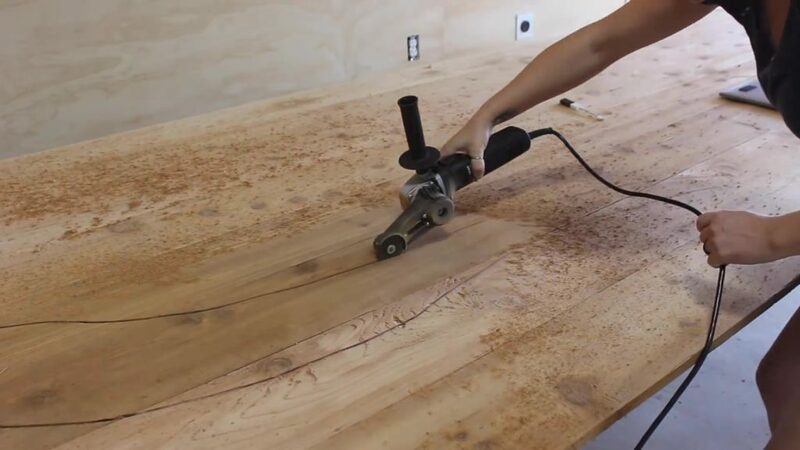 I learned on the first one to work backwards though because by starting on the outside and carving away towards the middle….I eventually loose material to keep my router base flat and the cut consistent. So instead, I would cut the outline then start on the inside and work towards the perimeter. I bet you can imagine that this was a pretty time consuming process, but I was enjoying myself as it was beyond exciting see these bow ties click into place one at a time. I did mess up on two of the cuts, but I don’t believe I got any footage of it. On two I completed the outline cut then when I was working on hogging out the center material, I lost track of my outline and ran outside of it. I was kicking myself, especially doing it twice, but it is easy to lose track of that outside line after a few mins of cutting. So I recommend stopping and cleaning out the cut every few minutes to keep a clean eye of sight. I ended up fixing my mistakes with sanding them and easing their edges some. In the end, you can’t see them unless you are specifically looking for them. After getting all the bow ties cut, I removed them from the slab and took them outside for a coat of paint. I started off with two coats of primer first. While that was drying, I moved inside to give the slab a coat of protection. I’m using a Semi-transparent stain in the color of cedar. This will keep the slab from graying-out over time. By the time I was done with the slab, which I coated on the front and the back, the primer was dry on the bow ties, so I gave them two coats of paint. For this gate, I’m going with a Hammered texture paint by Rust-Oleum. It’s designed for outside use and also for metal. While the can calls it a brown, I would almost call it a pewter color mixed with brown. Whatever it is, I think it’s a lovely color that goes very well with the cedar color. While I was in the painting step, I wanted to get the frame outside to also get doused. But first a few details needed to be sorted. First I drilled some weep holes in what will be the bottom of the frame, so that when it rains, water has a route to escape. Then I also cut some flat bar material and welded the ends of the open tubing close. Now the frame could be moved outside and jiffy-rigged to stand up while being painted. You can see I used a set of super jaws on one end, then a ladder rung for the other. Same as the bow ties, I gave the entire frame two coats of primer then two coats of paint. I’m painting it first because once I have the slab in the center, I will weld the frame closed and then it would be a nightmare to paint without getting it all over the slab. Once everything was dry, it was time to set the slab into the bottom frame. This was nerve wracking as the slab at this point isn’t that secure feeling, because of the giant cracks. So I first used a scrap board to scab over the largest crack and provide some support. Then, with help, I inset the slab into the U-channel of the bottom “L” of the frame. Next was to lift the top half of the frame into place, but before that, while I still had access I placed some nuts in the bottom channel, under the center slab, so when it does rain, the slab won’t be sitting in a pool of water. Alright, next I grabbed Cody’s help to set the top frame into place. I could now weld the frame close. Since I repainted the frame, I used a grinder to ground off any paint in the way of where I needed to weld. Then after laying down a bead, I used a grinder to knock it down smooth so it would look seamless. To do any touch up paint, I ripped off some cardboard thin enough to fit between the slab and the frame. Lets move to adding in those cool bow ties, shall we. I thought about gluing them in but instead decided to anchor them in from the back. I cut some 3/4” square tubing and first welded them into the frame where they would be covered up by the bow tie and not able to be seen from the front. Going to the back, I drilled a hole through the back tubing, set the bowtie in place, then marked where on the bowtie lined up with this hole. This is so I could grind off the paint on the back so that I’ll have a clean work surface to weld the head of the carriage bolt to. You can see I marked with a sharpie where the head will land. Now, before setting it back into place I slip in the carriage bolt again but this time with the head facing the bow tie, then place the bow tie in it’s spot. Then I could ground off to the bolt itself, shove it up against the bow tie then give it a few good tacks to hold it there. Next I could thread on a nut and have an easy way to draw in and hold onto the bow tie. I like this method over gluing them in because I don’t know how the wood will react over time to these. I’m curious to see if the wood movement will pop them out, or maybe deform slightly around them, or if it will all work great together. Either way, I wanted to leave myself a way to take them off and do some work if the need arises. Man alive, it was a ton of work to get this far and I can’t tell you how pleased I am with it. I love having a gate that is super unique and representative of something I love. I also really like that only a small population of people will be able to see the gate and understand what it is. Stay tuned for the next video where I cover the installation process of this gate and the previous gate. I’ll see you then.